Well, I have crossed another important threshold in my adjusting-to-life-abroad process, which was going on vacation and coming back home to Quito. I spent nine days in three Colombian cities – Medellin, Cartagena, and Bogotá – for my vacation. I have a lot to write so I’m going to do one blog for each city. I hope you find time to read them all. Those who are facebook users can also see photos from the trip on my profile. I arrived in Medellin on Friday, October 7 in the early evening. I was met at the airport by a family friend who lives there with his wife and almost-two-year-old son. This friend, to me, was a long lost acquaintance, who 11 years ago completed his master’s degree at the University of Colorado at Denver. For the two years he was there studying, he lived with my grandparents in their downtown apartment. I am grateful for my grandfather’s persistence in keeping in touch so that I could make the connection this time around. So, international friend picked me up and took me back to his apartment to meet his wife and young son. I stayed with them for three days and they graciously took care of me and showed me around Medellin. The evening of my arrival we had dinner at home before putting their son, Matias (the Spanish version of Matthew, Mati for short) to bed. They have a live-in housekeeper, so we were able to go out for a bit once he was sleeping to a place called Parque Lleras (Yeh-ras). 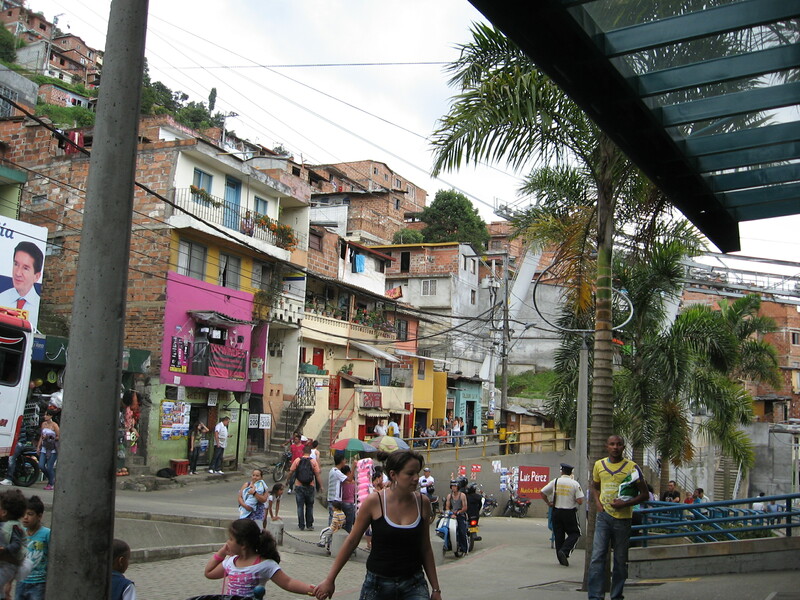 Knowing that I would be staying with locals, I did not do any research about what to do or see in Medellin, but a friend had recommended going to Parque Lleras and so I had passed that on as a request to my hosts, not knowing what it meant. Parquein Spanish means “park,” so I figured it was just some special park. Well that was right, but not quite what I had so briefly imagined. Parque Lleras is a park, but when you say Parque Lleras, what you actually mean is the bustling night life that surrounds a small urban park called Parque Lleras. So, my hosts complied with my uninformed request and we walked around Parque Lleras Friday night eventually settling at a little restaurant and to have something to drink while we took in the atmosphere. It really is a neat place. The park is small, but is full of people late into the night, though many of them drunk 20-somethings. I kept thinking, I wish Quito had a place like this (maybe it does and I just don’t know…), but my observation has been that mostly people loiter outside in Quito, except to smoke just outside the doors of their chosen institution. There isn’t a central, outdoor place between bars and clubs where people can stop and sit down to chat or anything. Not to mention, people are generally hesitant about loitering outside anyway or wandering off the busiest streets due to safety concerns after 8 pm. Parque Lleras is a nice public area to model. "Take of your shoes and feel the energy of the planet." 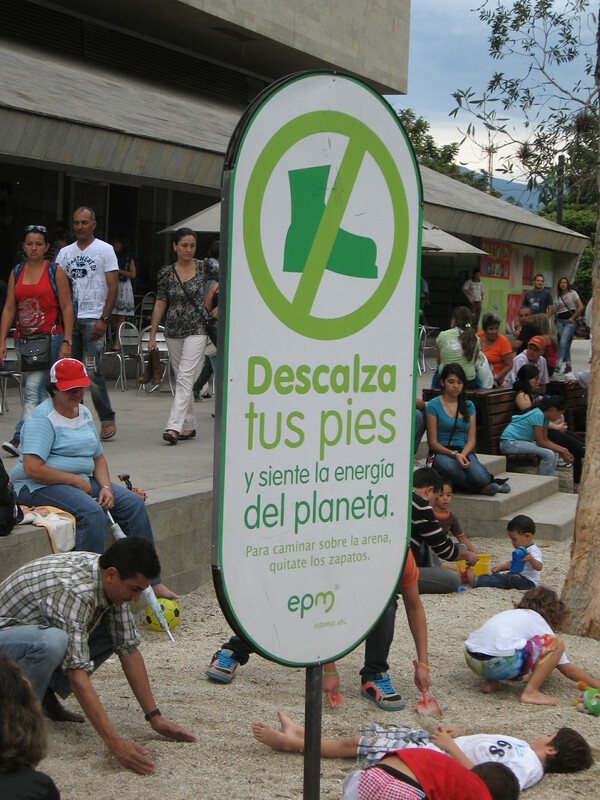 Another model-worthy site in Medellin is the Parque de Los Pies Descalzos (Barefoot Park). We didn’t spend much time at this one, but I think it’s a brilliant idea. It’s a park – more like a giant public sand box – in which you are required to take your shoes off. The sandbox constitutes one part of the park, and another part has water fountains. What better way to force people to connect with their inner child than by mandating that they remove their shoes to play. 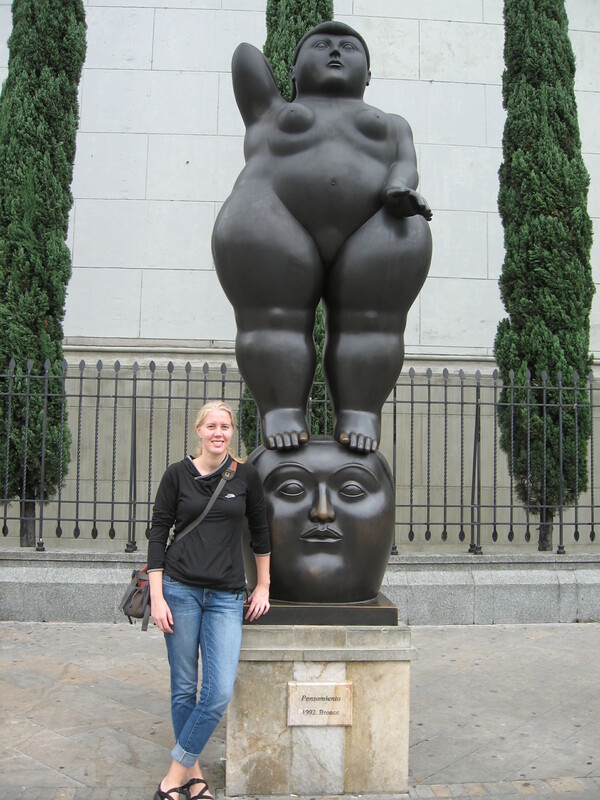 On my second day there, my hosts took my on the Medellin metro to the center of the city where we walked about to see Plaza Botero and the collection chubby statues that line the plaza and other landmarks. His parents got Matias super excited to ride on the train for the first time in his little life. Life is so full of wonders, isn’t it? Speaking of wonders, the Medellin Metro has HUGE train cars. They are at least 50% wider than the new York or Washington, DC subway cars (probably because it’s an above-ground rail system). That afternoon, we drove out of the city to the finca owned by my friend’s parents, and previously his grandparents. Finca is a general word that just means “property.” I first learned it in the context of small plots of land where people do small-scale farming, but I discovered on this trip that it can also refer to a property that is also more like a vacation home. So, it just means property that can have many uses. There we spent the afternoon with my host’s family enjoying the fresh, country air. And in the evening we drove to a nearby town to see what an authentic pueblois like. The next day, we took the metro again up to a nature reserve outside the city called Parque Arvi. The most amazing part about this commute was the second leg, in which we rode up, up, and over the ridge bordering the city in a cable car. The Medellin Metro Cable line is generally considered to be the first public cable car in the world, and is part of the metro system. It serves not only the park, but also the neighborhoods going up the hill side that would be otherwise inaccessible by metro rail. The views of the city and those neighborhoods were pretty awesome. 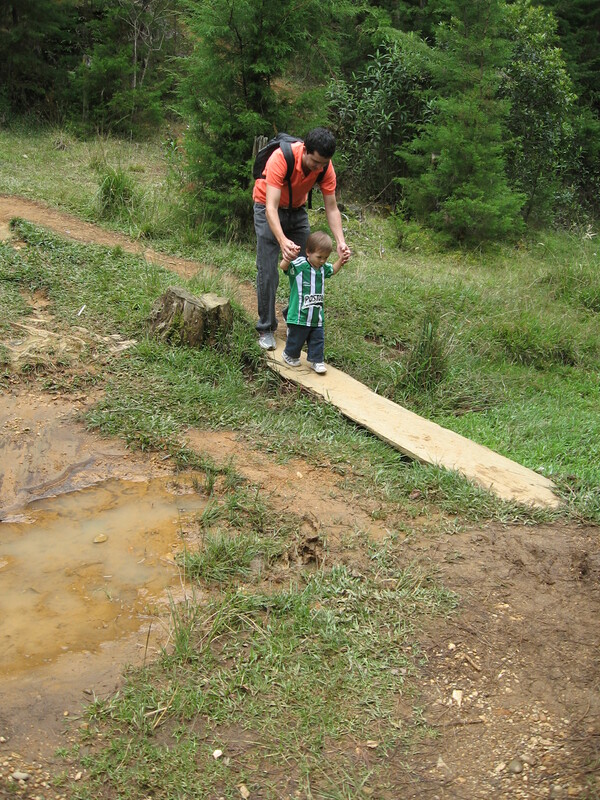 At Parque Arvi, we went for a short but more-technical-that-we-expected hike out to a waterfall. There were lots of people out camping and taking advantage of the park, which was opened only about 10 months ago. That afternoon, after returning to the house for nap time (I took one too), we went out again to see more of the city, including the barefoot park mentioned above. In addition, we visited Pueblo Paisa (Py-ee-sah), a tourist destination that resembles a local village, like a real one we visited the previous evening. It is also situated atop a hill in the middle of the valley which offers a 360 degree view of Medellin. Many locals go to visit this little town and we saw a number of people flying kites on the green. That evening, we had dinner at home and skyped with my parents, who were better acquainted with this friend during the time he was in Denver. Matias was done eating and to keep him busy his parents had set the computer in from of him with a YouTube video of The Magic Flute. The computer rang with the Skype call as we were finishing up dinner and so we quickly answered the call, taking the computer away from Matias – huge mistake. That exhausted little boy burst into tears at the loss of his operatic distraction. Later his parents explained that that day had probably been the busiest, most active day of his life to date. On a slightly different theme, I think I’ve mentioned at least once, that people don’t plan ahead. Everyone is always late and everything happens at the last minute. My friend in Medellin shared with me a theory about why this is, which I think makes a lot of sense. He, of course, has the perspective of someone from Latin American who had also lived in the very structured, timely United States. His theory is that Latino people are bad at making plans in advance because for millennia, their climate and location have never required them to think ahead. Generally, across this continent, there are no seasons. That means that you can get fruit, grains, meat, whatever, at any time of year – you don’t have to plan ahead and store for the winter months during which basic stables will not be available. This contrasts to the stereotypically rigid American and northern European cultures, which have very distinct seasonal changes. So, after thousands of years of development in a place where the people don’t have to think ahead and plan for seasonal shortages, the result is a culture that just doesn’t plan anything! That’s an exaggeration, of course, but seriously, it feels really out of control and haphazard sometimes. In my mind, that theory holds water. 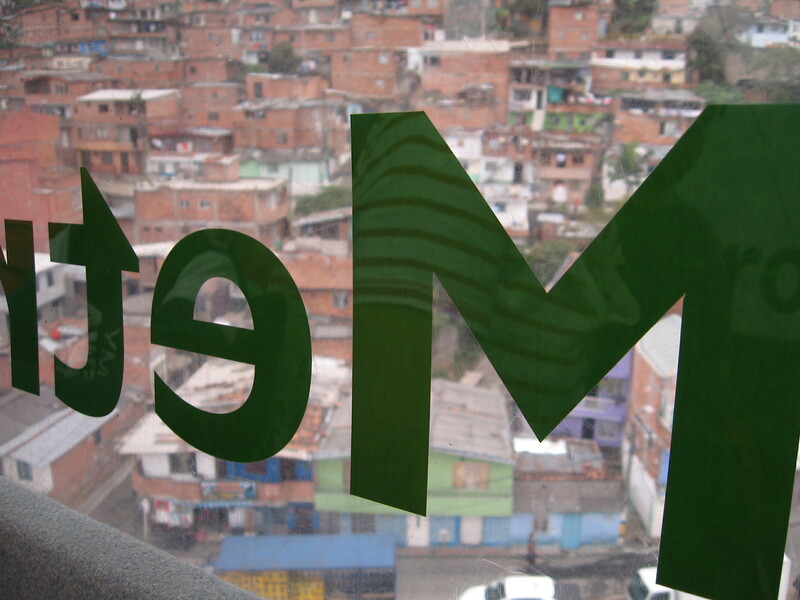 All in all, I really like Medellin. It felt vibrant and safe. I look forward to going back — who knows, maybe I’ll head to Colombia after my year here. I was so grateful to be able to get to know Colombia with locals before moving off on my own, and they were such incredible hosts. That’s the way to get introduced to a country. Bahhhhh, that little guy Matias is so precious! I want to meet him and talk to him about opera. 🙂 I like the theory about Latinos vs. northern Americans, too – that makes a whole lot of sense. It reminded me of Guns, Germs, and Steel… I feel like that’s something Jared Diamond talks about. Lovin the posts as usual, lady! A great idea to focus on one place at a time. 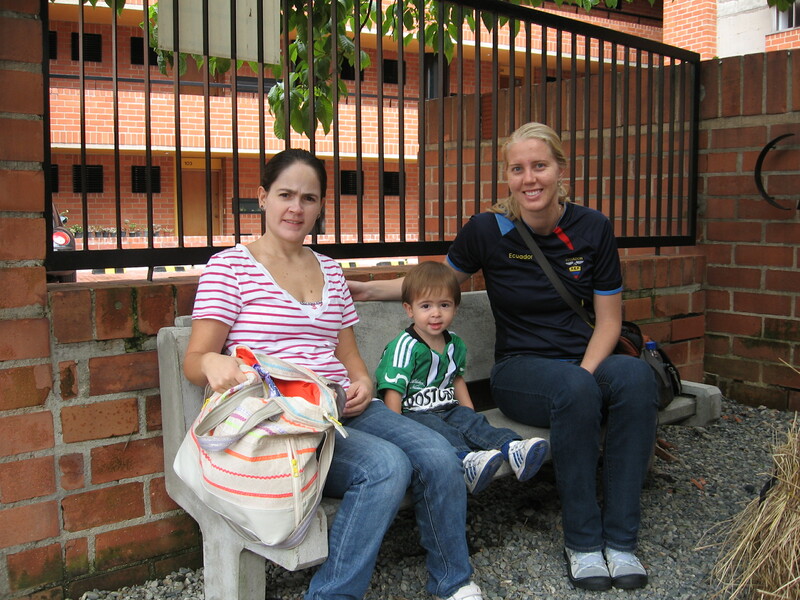 Great you were able to see Medellin with locals. I feel you miss a lot if you visit a place without connecting with the people. Interesting theory about the people there not planning ahead. I guess this could be overdone in either direction — rigidity or strict planning on one hand and no planning at all on the other. Rachel, you’re doing a brilliant job of getting me acquainted with places I will never get to see. One of my fave night life experiences in Quito is down in the old town on La Ronda (Fri & Sat nights) — live music and dance in the streets, lots of cafes, canelazos in every doorway. If you haven´t been, I recommend it!